Supreme Chef is a competition involving Sri Lankan Chefs, some who have come from rural backgrounds, thrusting into the limelight. These heroes had to come up with something special to do be a survivor in the competition. 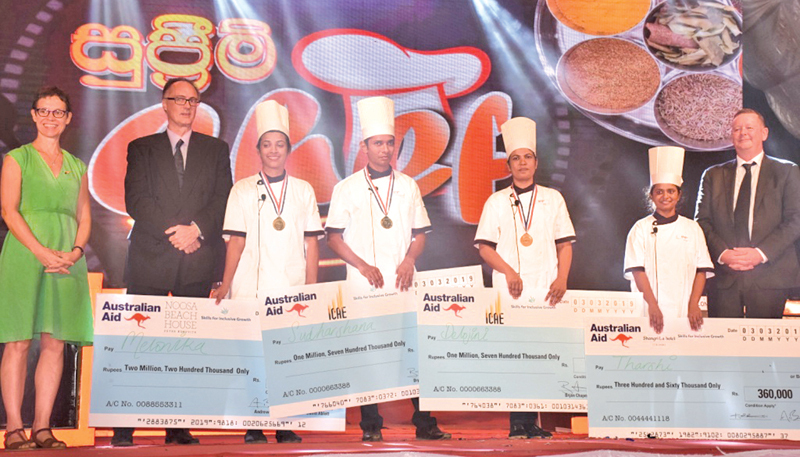 Supreme Chef was a televised reality competition designed and implemented by Skills for Inclusive Growth (S4IG), an initiative of the Australian Government’s aid programme in collaboration with the Ministry of Skills Development and Vocational Training. Daily News met up with the three culinary champions who emerged winners of the recently concluded reality TV show. They will soon be on their way to Australia for a month long training programme under the guidance of renowned Australian-Sri Lankan chefs Peter Kuruvita and Jimmy Shu. Upon completion of their training in Australia, they will return home to join Sri Lanka’s growing tourism and hospitality industry. Australian Deputy High Commissioner, Victoria Coakley, addressed the three winners and said this is an opportunity that will change their lives as they will be mentored by some of the best in the industry. “The links between Australia and Sri Lanka are strong and this is very heartening. Your dreams and passionate commitment to cooking have brought you to where you are now. We are very excited for you and we understand that after you return to Sri Lanka so many avenues will open up for you. Being a chef is an important part in the tourism sector,” said Coakley. When you take all the contestants, the show has transformed their lives and taken them out of their homes and into five star hotels. They have had the chance to associate with giants in the industry. They have had the opportunity to appear on national television. “I really admire these contestants because of the courage and confidence they have developed through the show. It has been a tremendous effort. You are really role models for other young people and what a journey it has been for you! You have really risen to the occasion and met the challenges. There is a lot of talent in Sri Lanka. It is a good time for the tourism sector in Sri Lanka and it will really open up a very large number of jobs for Sri Lankans. Programs like this can only promote this cause. This is where Supreme Chef has really played a crucial role. The contestants get a chance to work with professional chefs. This show really generates a large audience. But we never envisioned such success. 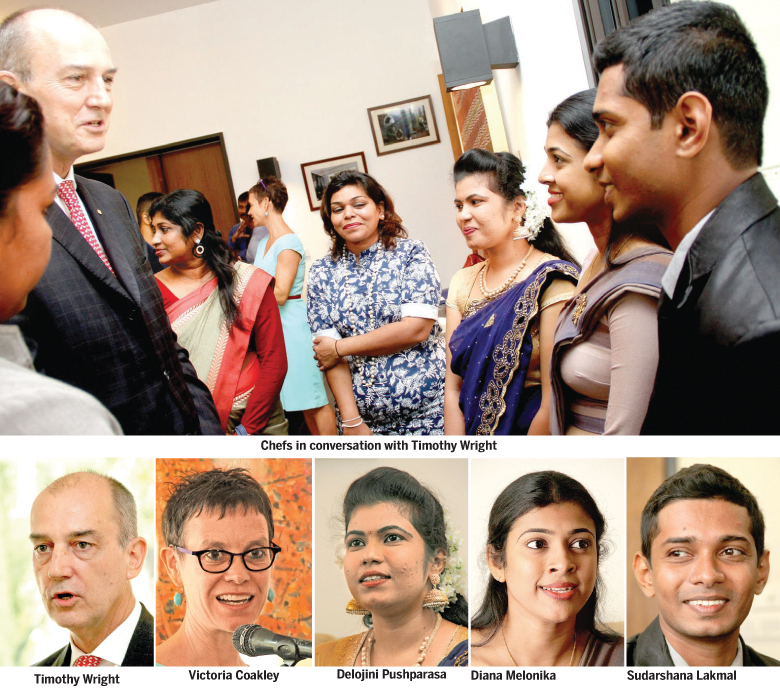 We see that an interest in the tourism sector in Sri Lanka is on the rise,” stated Coakley. Shangri-La Hotel Vice President and General Manager Timothy Wright said that one element of hospitality is the fun aspect. This industry gives you the opportunity to be creative and in order to succeed what you need is passion. “When we look at the talent at Shangri-La, success has a lot to do with attitude as well. We are looking for people with attitude, not necessarily those with long CVs. If they have the right attitude then we can train them with the skills they already possess, but the key is attitude. We need them to be passionate and enthusiastic. We work long hours but we also have fun. Having fun is important. I really think this show is commendable,” said Wright. Diana Melonika from Pollonnaruwa who won the first place comes from very humble beginnings having operated a juice bar before rising to fame. She learnt how to cook by watching YouTube. With the blessings of her husband she decided to give the show a try. Initially she was nervous but as things progressed she also started to grow in confidence. “I was determined to do well. Things really started to improve for me and I grew more optimistic. I had to compete with other contestants and applied myself diligently obtaining knowledge from the Chefs that I met. I read so many books. Soon victory came after victory as I progressed through the competition. I had a positive attitude and really put my heart and soul into what I was doing. Finally I got the chance to go to the Shangri-La hotel. I had to compete with a lot of males there, and that was a challenge. It is a dream come true,” said Melonika. Melonika states that during the competition they were never neglected or faced any form of indifference on the part of the judges. “They encouraged us to experiment and told us that the best way was through trial and error and that they would always be there to guide us. I am really excited about going to Australia because I want to learn as much as I can and take the most of that experience,” said Melonika. Sudarshana Lakmal from Pollonnaruwa who came second said that from the beginning he was on a winning streak. He also stated that the process of mentoring really helped in the competition. “I was taught to be resourceful and innovative. I really learnt a lot. I too come from very humble beginnings. My father got to know about this competition. I remember at my first appearance in the competition I realize it was not going to be easy then and there. All the Chefs that mentored me guided me in the right direction and explained the methods of cooking to me. We were all brothers together in the competition. I am just relieved to have come second place. I consider this an opportunity for me to learn. I have definitely made full use of this competition,” said Lakmal. Lakmal still frequently uses you tube and enhances his skills. His powers of grasping culinary styles is amazing. “Going to Australia is something special. You know the culinary field is something where there is so much more to learn, because with time it changes. So I need to keep up with the changing trends. I am open to anything. I love it when people enjoy my dishes,” said Lakmal. Dilojini Pushparasa from Ampara who ended in the third place, got to know about this competition through a friend. “I gradually started to make my way through the initial stages and started to grow in confidence. I was able to create the dishes within the given time frame. My dishes were thankfully delicious! And I received the approval of the judges which was great relief for me. When I arrived in Colombo I learnt theory and practical. When I first came before the camera I was so nervous but with each episode I kept on being tenacious. First I was able to cook only Sri Lankan dishes but as I progressed in the competition out of necessity I started to cook other dishes. I read many books on cooking and started to expand. I really enjoyed making Chinese and Indian dishes,” said Pushparasa. At Shangri-La the finalists were given intense training. To be able to cook at the finale they had to lift their standards in cooking. “At the finale I had to cook sea food, salad, fish and chicken at the finale. This journey has done wonders for me and my cooking. It involved precision and perfection. For me it was a gradual process and I was constantly reminded that I could go home anytime but that did not happen obviously. But I just thought of working hard and I had real hope of being a finalist and a winner. I have really worked hard to be where I am today. I must thank my mother for reminding me that I could win being a woman. My mother pushed me to be the best version of myself,” explained Pushparasa.